A hit and a miss! The hotel designed to compete with Embassy Suites before the Embassy Suites brand joined the Hilton family. There are only 7 or 8 of these in the world. The design is great and I like that it is not 10 stores tall so the public spaces feels warm not caverness like some Embassy’s. Walking up to the front of the hotel I noted cigarette butts against the curb, the ashtray was over flowing, the van driver sitting in the van and in the entrance the vents where not clean; all of these points to no follow through and not attention to detail. The staff is great, kind, warm hearted but not attention to detail. 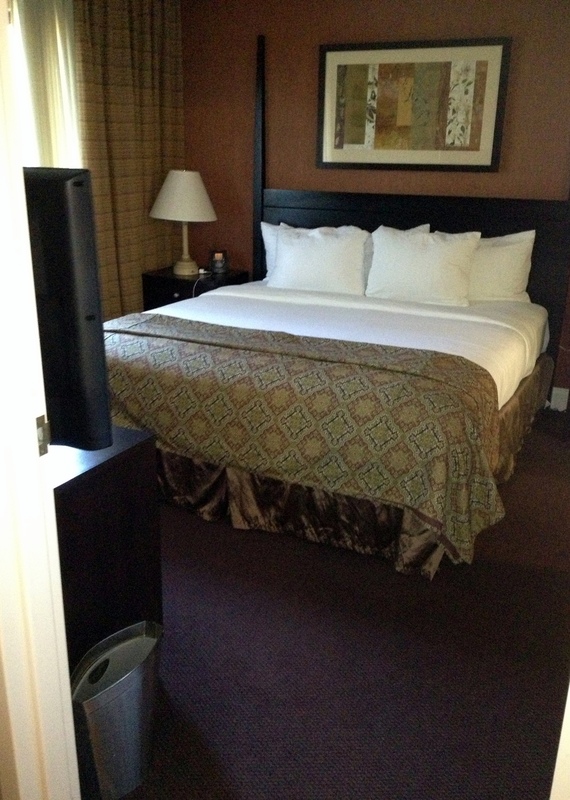 My room was well decorated with 2 huge HD flat panel TVs, clean but not well maintained. The shower had paint chipping off of the tiles, the wall paper had two patches both peeling, the tub had a bad patch job, the soap dish had paint chips the towel rack was bent and had paint over spray on it. I reported that the shower curtain rod was sagging at 8:12am at 2:10pm it had not been addressed. Informed the desk person of all the items listed above along with the short in the lamp and was giving a hardy thank you we will get it fixed. The towels placed in my room had a hole in it and the room attendant placed the one towel with the one hole in the center facing the front. The business center is great (although it was hotter than hell) 2 large screened PC’s and 1 Apple; I sat in the center typing this I asked a co-guest what he thought of the hotel. He stated that his company has been using this hotel for a long time. But he could tell that this trip, thing are starting to show signs of wear and tear. He went on to state “but the staff here is great”…agreed! My car would not start and the maintenance staff went out of their way to help, spending almost 30 minutes trying to jump it off. Mark at the bar is great, he knows his drinks and knows how to make each guest feel special. The pool table is a nice touch and the sitting area off the lobby was comfortable and welcoming. I would stay here again, but not for $189.00 per night.